"Draw & Code titles available for Merge Cube"
The team at Draw & Code have delivered two launch titles for Merge’s new augmented reality toy and game system the Merge Cube. 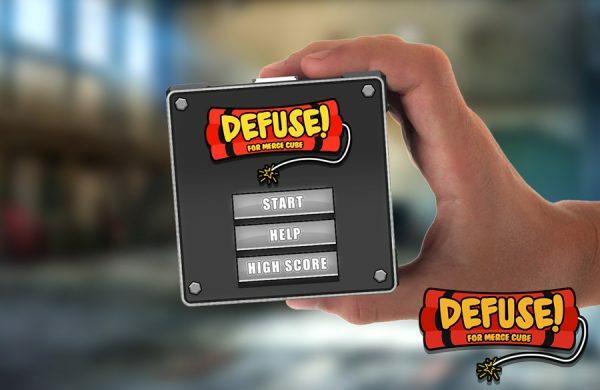 Defuse puts a ticking bomb into the hands of the player while Snake Attack is a challenging three dimensional puzzler inspired by the mobile classic Snake. The games are part of the family-friendly array of mini-games and educational experiences, produced using Merge’s SDK, that are available to download for free from the Merge Miniverse (www.MINIVERSE.io). Both Defused and Snake Attack are designed to be instantly accessible to players, using simple play concepts and intuitive control methods that invite the user to explore the Merge Cube’s unique take on the video game interface. Draw & Code are but one of a tiny handful of developers in the world with prior experience of a video game controlled and displayed on the surface of a cube-shaped toy. As many of you will know, we are currently producing SwapBots, an augmented reality toy and video game that will be available later in 2017. Having originally met the brains behind Merge a few years ago at the Augmented World Expo (AWE) it was logical for us to get involved in a platform that parallels the direction that we see this technology heading in. The Merge Cube was released to the public in August 2017 and aims to blend the latest high-tech mixed reality techniques with the accessibility of mobile apps. With a low retail price of $14.99 and availability at Walmart, the world’s largest retailer, the Merge Cube is ideally paired with the Merge VR/AR Goggles. Draw & Code have previously created AR and MR re-interpretations of other classic games such Space Invaders and Pacman, finding that using new versions of familiar gameplay mechanics and scenarios is a one way of introducing gamers to new technology. The emergence of XR in games has primarily focused on expensive hardware, but Merge offers a sophisticated new way to interact with software that is positioned to appeal to a wide age range and at an accessible price. The Merge Cube is available now online and in Walmart stores for $14.99 with both Defused and Snake Attack available to download for free from Merge VR’s Miniverse digital store.